The material brought to the landfill each year produces enough energy to power almost 2,400 homes through Ada County’s Landfill-Gas to Energy program. The Ada County Landfill is self-sufficient…it does not receive any tax dollars. Its revenue comes from user fees. You can bring all your hazardous materials…paints, pesticides, fertilizers, cleansers, etc. to the landfill on Fridays and Saturdays at no cost. Household Hazardous Waste program is also a recycling program. Since many of the materials brought to the landfill are still usable, you can go to the landfill’s Household Hazardous Waste Facility and pick up some of your needed chemicals at no charge. You can bring unwanted television sets and computer monitors to the landfill at no charge. The material brought to the landfill each year produces enough energy to power almost 2,400 homes through Ada County’s Landfill-Gas to Energy program and generates a revenue stream of approximately $272,000 per year. One of the largest recycling programs in Idaho is run by the Ada County Landfill. It’s the county’s wood waste recycling program, reclaiming around 150,000 cubic yards of waste each year. All household and small quantity generator business hazardous waste is processed through the Household Hazardous Waste Facility. The EPA requires that Ada County monitor and inspect the landfill for 30 years after its closure. On average the Ada County Landfill accepts over 400,000 tons of ordinary waste every year that’s over one ton per person per year! On average the landfill diverts 182,464 pounds of E-Waste per year. From voluntary drop off, the Ada County Landfill Recycling Center processes, on average, 588,535 pounds of metal per year. On average there are approximately 4,500 tires diverted from the landfill every year. 10,000 cubic yards of wood chips are diverted at the landfill monthly. Is your civic, school, church, or scouting group interested in what happens at the Landfill? Call the Ada County Landfill and arrange for an informative tour of the landfill and Household Hazardous Waste Facility. Come see what happens to your trash. You might be surprised. Opportunities for landfill tours are limited due to transportation and staff availability. 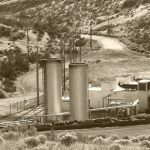 The Ada County Landfill is engaged in a project that runs primarily on a naturally occurring byproduct of landfills—landfill gas. The Ada County Landfill extracts the gas from the landfill and sells the product. The purchaser of the landfill gas uses the commodity to produce energy by processing the gas into electricity. The landfill gas that comes from Ada County produces enough electricity to power approximately 2,400 homes for one year and generates a revenue stream of approximately $272,000 per year. The gas is extracted from the landfill by a series of pipes and wells. The Hidden Hollow Cell was started before the technology for gas extraction existed. To install the extraction pipes the landfill crew drilled and dug into the decades-old trash to install a series of pipes that are connected to a vacuum. This vacuum pulls the landfill gas into the extraction system. Whatever gas is not extracted is processed in the onsite flare, where the gas is destroyed. Environmental responsibility of the Landfill is mandated by the Environmental Protection Agency (EPA) and by Idaho State Law. However, the environmental impact of the landfill is a social responsibility. The EPA requires that Ada County monitor and inspect the landfill for 30 years after its closure. However, Ada County makes a conscious decision to divert as much waste from the landfill as possible. With waste diversion programs, such as wood recycling, e-waste recycling, and the Household Hazardous Waste Facility’s Material Reuse Program the items that are diverted from the landfill are repurposed and the space that would have been taken in the landfill can, likewise, be repurposed. By taking these steps to extend the life of the landfill we ensure that the environmental future of Ada County is secured.